CRESCOtec is using Citrix GotoAssit for remote support. Customer can call us on our support number or email on support@crescotec.com to get the support key. You can also reach the support team on +971 4 406 9654. What is the license validity of the CRESCOtec products? All our products are licensed for life, or as long as the subscription is active, whatever applicable. How to take a database back-up? 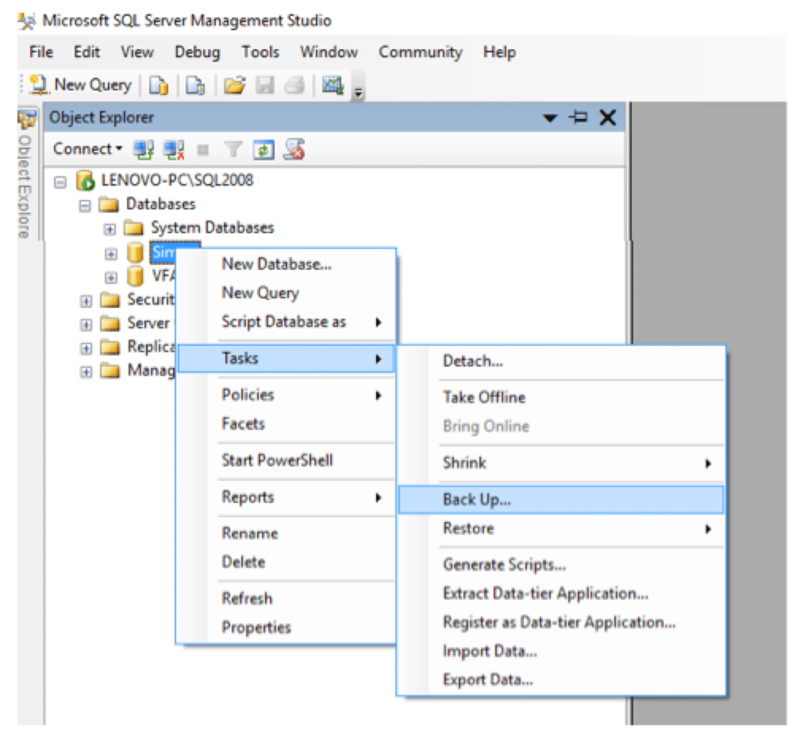 Open Microsoft SQL Server Management Studio. 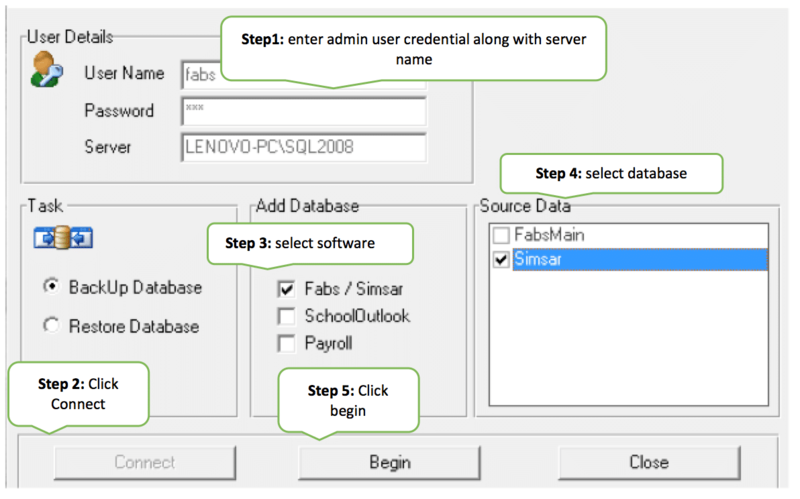 Right click on desired database and select back-up. How can I activate the application? CRESCOtec provides two types of activation depending on which version of the application you are using. In the older versions, the application will ask for activation key when you run the application for the first time. You need to contact our support team and provide the User Ref number. Our team will provide the activation code to you. If you are using the new version of the application, you can activate the product online by following a simple wizard on the screen. You will require your Customer ID in order to activate the product. Activation applies only to the desktop solutions. 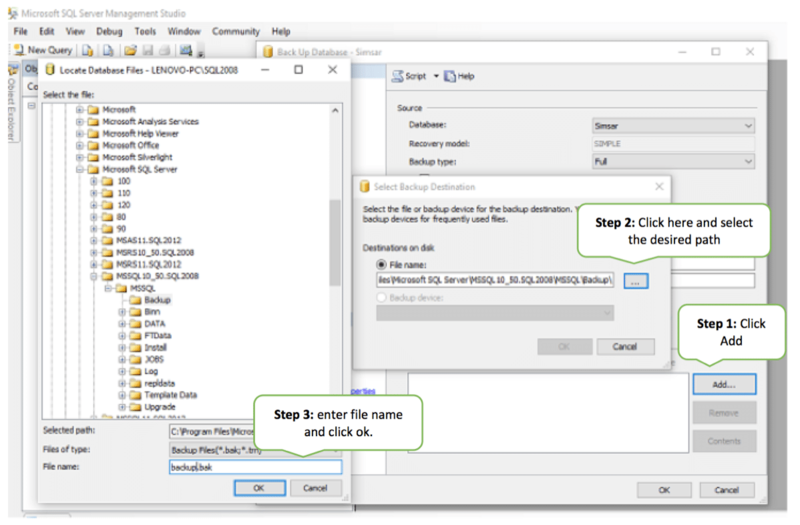 How to migrate the application from one PC to another? Self-migration is available to all the customers who are using the latest version of the application using the online activation system. You can simply install the application in the new PC and get it activated via the online activation system. The application will only allow simultaneous logins for the number of licenses purchased by the customer. If you are using the old version of the application, which uses the traditional activation mechanism, you should contact our support team. Our team will deactivate the license from the old PC and migrate it to the new one. How to install the CRESCOtec products? To install any CRESCOtec desktop product run the setup file which was provided during the initial implementation and follow the wizard. a. Check if the Server is ON. Please give us a call if the login still doesn’t work. The application closes with connection error after an idle period. Make sure the server has no settings to sleep or shut down after a specific idle period. What happens if I do not renew my AMC? As all our products are licensed for life, you can still continue to use the application. But you will not be eligible to get technical support from our support team. How do I get the latest version of the application? You can get the latest version by ensuring that you have an active AMC. Our support team will update you to the latest version when you get online technical support. The Customer ID is a new integral part of our online support system. Please contact our support team to get your Customer ID, in case you lost it. How can I download the set-up files?